A while back I posted some renders on DeviantArt of the Mac Anu Chaos Gate room from The World R:2. I would be much more further in progress if Minecraft didn’t come along and be so darn awesome! As you can see there aren’t an UI elements available, they’ll come later. But, what I was mainly working on here (today) was a way to “easily” load up levels/stages. I went with property list (plist) files which are pretty much XML files, but since I’m on a Mac, there’s CoreFoundation methods to use it in C/C++. It is a bit messier than using the NS framework for Objective-C but what can you do. And well, XML is easy to parse anyway if I ever move this to Windows. But ,back to using plist files (or XML). This is mainly since it should be additionally easy for servers to send clients the data for generated areas by the keyword system, which I’ll be figuring out later down the track – finishing Mac Anu comes first! happy because of seeing my dream of an .Hack MORPG perhaps becomes true. unhappy because of knowing someone more skilled is working at the same thing. i just got an unfinished gate by now, not even animated, also done with blender. i currently was thinking about to quit learning directx and begin to learn opengl, and also find a way to start developing the game platform independent. 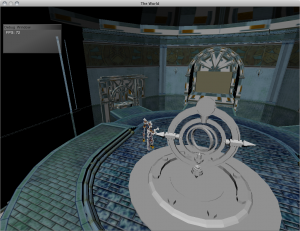 i thought a game named “The World”… should also be avalable to the world… to mac users, linux users, windows users, different systems like macs, pcs, notebooks and upcoming systems like tablets, smartphones and so on. wouldn’t it feel great, knowing that everyone is able to play “The World” everywhere, anytime? sounds nice, dosn’t it? such things buzzing around in my head sometimes. a pity that i won’t be able to play your game sometime. PS: good luck with your diet, if it works for you i’ll maybe try it myself sometime. Hey man, really like the ambition you have for going after something like this. Loved the GU games. I’m an animation major these day. Just thought I drop you a comment saying that I look forward to what you come up with. what about your diet and job? Job is taking up most of my time, but I’ve been keeping time to make sure I stay fit. As for TheWorldRF. Not mine. It looks good. Unity is an interesting choice too. But it looks like he’s using the original textures from the game? Something I wanted to make sure I didn’t do (i.e. make my own). Primarily since it gives less reason for CC or Namco to threaten me 😉 even if it means it takes significantly longer for me to make things. Hey, nice to see your blog online again. Previous page Previous post: Speed upgrade!